Among the conflicts to break out during the Cultural Revolution in Tibet, the most famous took place in the summer of 1969 in Nyemo, a county to the south and west of Lhasa. In this incident, hundreds of villagers formed a mob led by a young nun who was said to be possessed by a deity associated with the famous warrior-king Gesar. In their rampage the mob attacked, mutilated, and killed county officials and local villagers as well as People's Liberation Army troops. 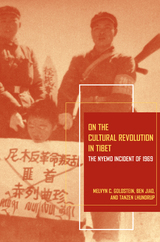 This groundbreaking book, the first on the Cultural Revolution in Tibet, revisits the Nyemo Incident, which has long been romanticized as the epitome of Tibetan nationalist resistance against China. Melvyn C. Goldstein, Ben Jiao, and Tanzen Lhundrup demonstrate that far from being a spontaneous battle for independence, this violent event was actually part of a struggle between rival revolutionary groups and was not ethnically based. On the Cultural Revolution in Tibet proffers a sober assessment of human malleability and challenges the tendency to view every sign of unrest in Tibet in ethno-nationalist terms. Melvyn C. Goldstein is John Reynolds Harkness Professor of Anthropology and the Co-Director of the Center for Research on Tibet at Case Western Reserve University. Ben Jiao is Deputy Director of the Contemporary Tibetan Research Institute at the Tibet Academy of Social Sciences, Lhasa. Tanzen Lhundrup is Deputy Director of the Social and Economic Institute at the Beijing Tibetology Center, Beijing.